“People should know that Valerie Jarrett is — and people do know — she is a very dear friend of the president-elect and a valuable ally of his, not only prior to running for president, in his Senate life, and just personally for Michelle and Barack,” Emanuel said on ABC’s This Week. Several other Illinois Democrats have expressed interest in the seat, including Rep. Jesse Jackson Jr.
Illinois governor Rod Blagojevich will make the final decision on Obama’s successor. Go Barack. You had the brightest team on your campaign, make sure not to lose their talents. Sarah Palin is not blaming the Bush record for the GOP loss. You take everything she says out of context. It was obvious that CNN was completely biased against McCain/Palin. It was disgusting journalism. I won't watch CNN anymore. 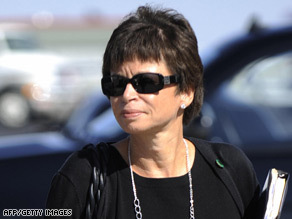 Jarrett is Obama's Karen Hughes ... only he's more on top of things than Bush was. I knew yesterday's ticker story was just a fishing expedition. There are no unauthorized "leaks" from No Drama Obama! LOL...This is an Illinois Senate seat...who but a Chicago politician do you expect to take it, someone from Texas? THINK !!! In this case, it is not only appropriate but required that someone from the State of Illinois takes the job. If you just got off a chain gang, more than likely, you are a felon who cannot vote. If you are an illegal, you cannot vote. Obama hasn't done anything yet as he is the president-elect, not the president. Apparently, the 33% that voted for Obama that have never worked in their lives, those votes are discounted because their voice doesn't mean as much as yours. Futhermore, you apparently forgot there was a Republican President who is still the one in charge while all of these negative items you listed are still going on. I hope the Republicans still have this attitude that they do no wrong and all wrongs are because of Democrats in 4 years. If that is the case I see an 8 year Obama presidency. I don't understand what you're trying to say. I think an=and in your message right?? I am still shocked that America would elect a black man to its highest office. I will be taking the day off to watch the inauguration. Most whites don't understand the big deal, maybe, but blacks do. And I feel happiest for the old timers that lived though Segregation and suffered so many indignities due to their skin color. I just can't believe it. Congratulations, America! I WOULD LIKE TO KNOW IF PRESIDENT BUSH WILL BE IMPEACH,SINCE MOST COMPANY'S ARE TAKING THEIR BUINESS OVERSEAS,EVEN IF THE COMPANIES TAKE BUINESSES OVERSEAS,WOULDN'T THAT SUPPORT MORE TERRORISM,AND WOULD GIVE EUROPEAN AND MIDLESTERN COUNTRIES A GREATER OPPERTUNITY TO KILL US,HOW IS AMERICA GOING TO PROTECT US,WITH THE LOSS OF BUINESSES IN THE US. Please people, let's try to have some dignity and respect for one another. If you are happy about this great moment in our history, just ignore the negative and irrational comments of others–let's try to be worthy of the rare example of dignity and respect that Obama and his family have modeled for us. Let Obama get into office. Smart picks to move his agenda – a rescue of this economy. Instead of badmouthing Obama, let us all hope and help him move policies that put people back to work. bob ss u are an idiot. Point blank.